Anna Whitt, the daughter of a guardian angel and a demon, promised herself she’d never do the work of her father—polluting souls. She’d been naive to make such a vow. She’d been naive about a lot of things. Haunted by demon whisperers, Anna does whatever she can to survive, even if it means embracing her dark side and earning an unwanted reputation as her school’s party girl. Her life has never looked more bleak. And all the while there’s Kaidan Rowe, son of the Duke of Lust, plaguing her heart and mind. When an unexpected lost message from the angels surfaces, Anna finds herself traveling the globe with Kopano, son of Wrath, in an attempt to gain support of fellow Nephilim and give them hope for the first time. It soon becomes clear that whatever freedoms Anna and the rest of the Neph are hoping to win will not be gained without a fight. Until then, Anna and Kaidan must put aside the issues between them, overcome the steamiest of temptations yet, and face the ultimate question: is loving someone worth risking their life? Why I am lurking on this: Sweet Evil is still sitting on my shelf unread, but I intend to read it before its sequel comes out. I wonder whose team I will be on...? Why I am lurking on this: A lot of people are lurking on this one... I just joined the hype, I guess. But mostly because I want to read something by Levithan. I heard great things about his books. I still need to read Sweet Evil! And I am really curious about Invisibility 🙂 I definitely want to check that one out. Awesome choices! I am probably one the few people who hasn't read the first book. Great pick. I am going to have to get book 1. I really need to read the first Sweet Peril book, I just haven't gotten to it yet. I also have an ARC of Invisibility, I'm just trying to find the time to squeeze it in. OMG!!! Yes I CANNOT WAIT FOR THIS ONE!!! Thanks for sharing and thanks for stopping by my WoW earlier. I have also heard great things about Levithan's books but have yet to read anything by him. Invisibility is also probably where I'll start. I also enjoyed Andrea Cremer's Nightshade series so win-win. I am late to jump on the Sweet Trilogy bandwagon but I definitely have my eye on Sweet Evil (aren't the covers beautiful!) Great picks this week! Both of these seem to be popular today! Oh great picks! I still need to read Sweet Evil! Did not know about the Cremer/Leviathan before and that is exciting!! Awesome picks! I'm especially excited for Invisibility. Hope you love both of these! I really enjoyed Sweet Evil, hopefully Sweet Peril will be just as good. 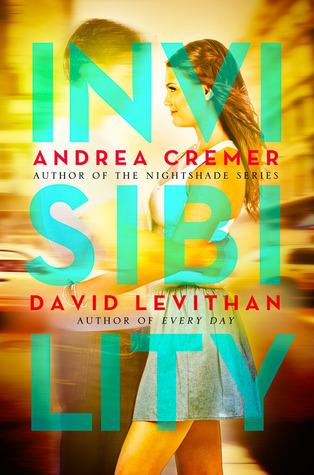 Invisibility by Andrea Cremer & David Levithan looks really good to me, great picks! Great picks! I can't wait to read both of these. I loved Sweet Evil soo much I was pretty much dying for the sequel the second I finsihed it - and then heard that is was questionable whether there would be a sequel at all o.O I was sooo relieved when it was definitive! Invisibility sounds cool, but I think I'd also mostly read it because I've never read anyhting by either of hte authors even though they are so popular.